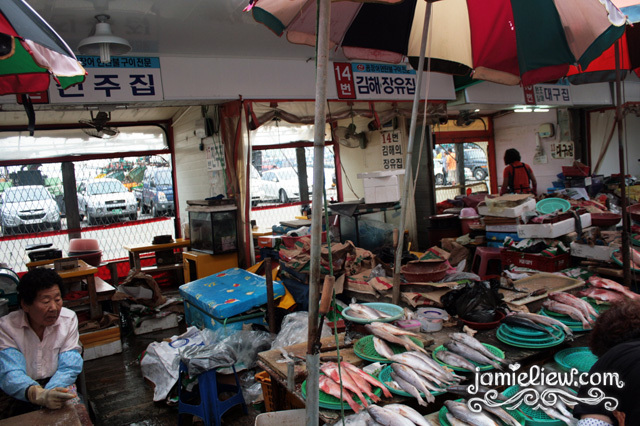 finally, my post for this famous market in Busan. it’s open air, very neat and there are a lot of restaurants. lesser foreigners than expected but a lot of old people pushing everyone around while dragging their trolleys around. 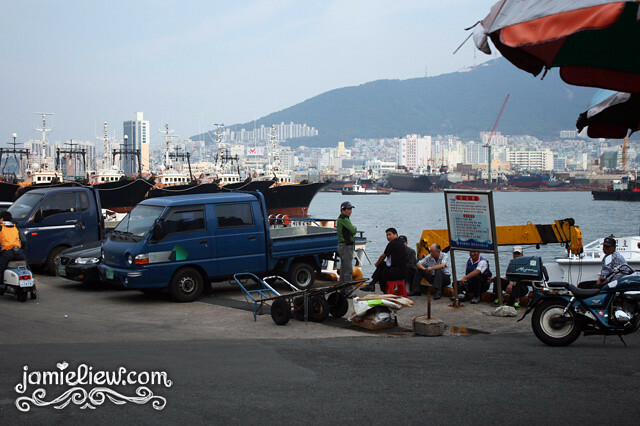 this is right behind the Market, the Busan view from here was magnificent. I love how the houses are so close to each other all over the mountain. =3. I am assuming that he sells dried ells but Leo said it doesn’t look like it. D=. 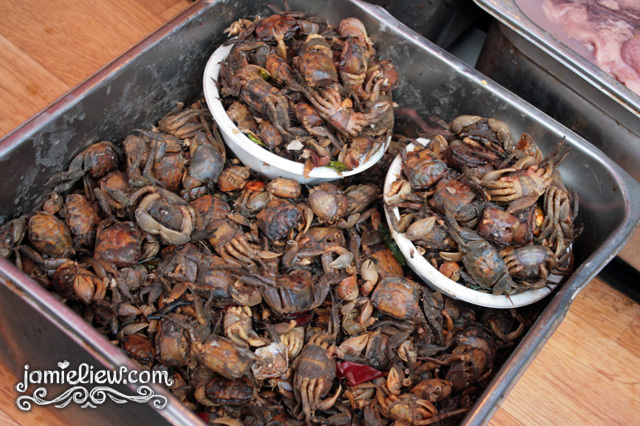 mini marinated crab. now how am I supposed to eat this? bite the whole thing like that? =S. weird! 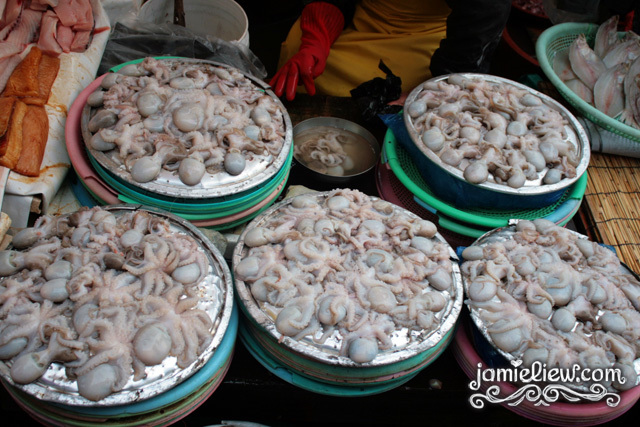 one octopus can feed more than 2 dozen of people I guess. it’s just so huge. 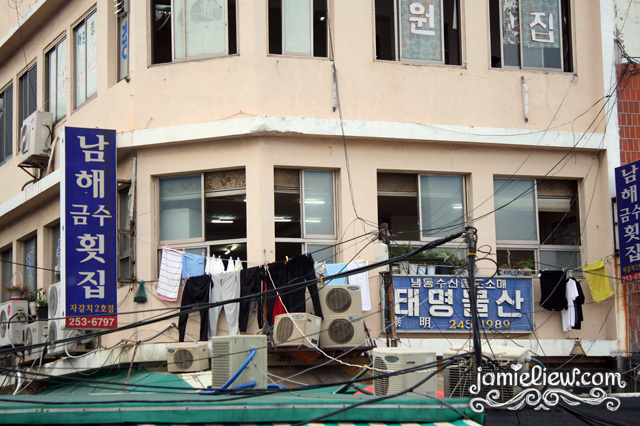 Jagalchi Market comparing with Noryangjin, I would say it’s how they display their items. other than having tanks all over the place the ones here are pretty much already all dead. 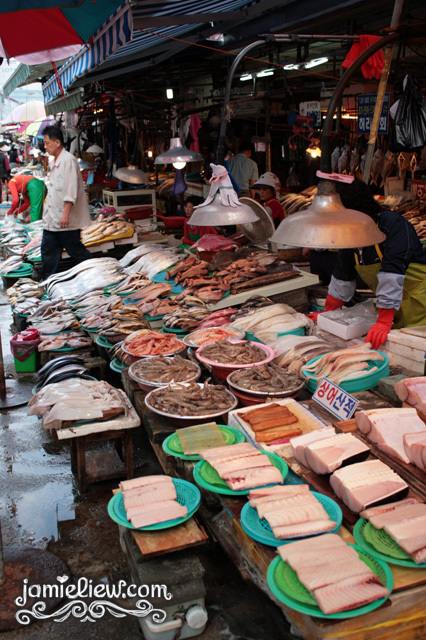 but it looks exactly like a Market (at least Malaysia’s. I mean, have you ever seen a tank in Malaysia’s Pasar Pagi?). 은어 I think it’s called Eun-eo. 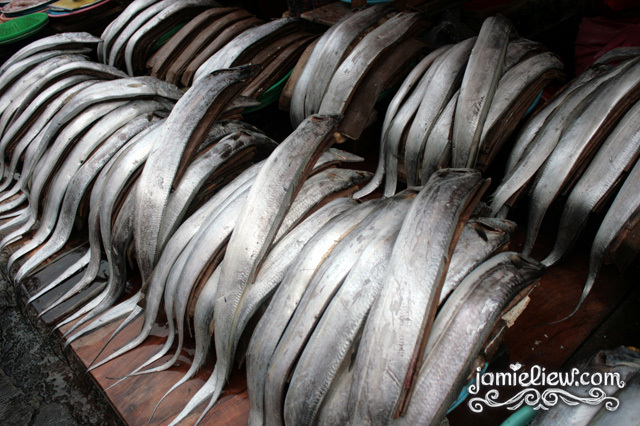 I remember my teacher teaching us about a long silver fish which literally means silver fish. look they put fishes in a wooden box too!! and holy huge stingrays. 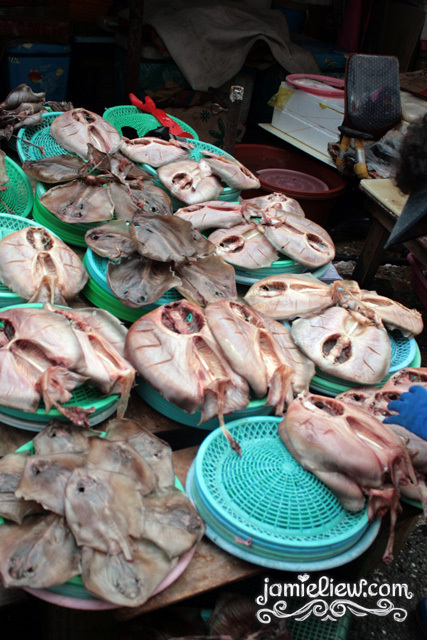 I am guessing these are stingrays too. silver fish! so photogenic these fishes =3. too cute to not snap. baby octopuses. not as baby as the ones served in Jap restaurants. don’t know how people are supposed to cook these actually. it’s like at it’s awkward age just like when I was 11 there were literally no clothes that fitted me. this is going to sound sucky. 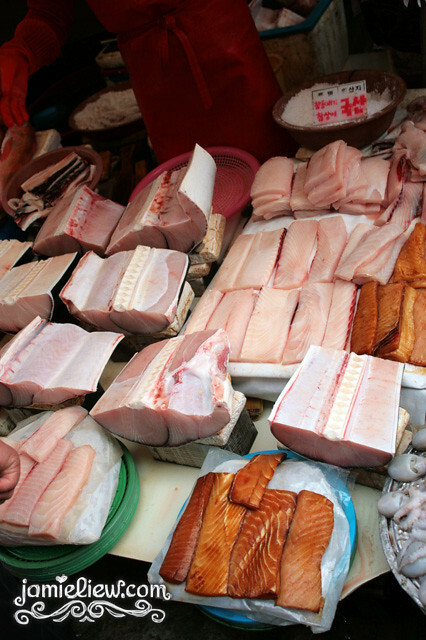 but these are whale meat. 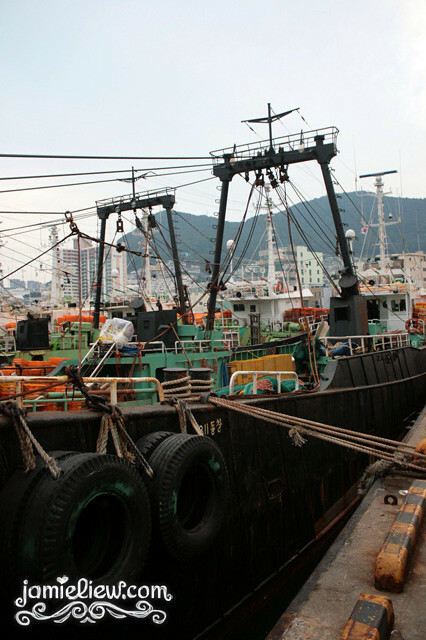 yes, Koreans eat WHALES. so do Japanese. I WON’T EAT IT T_T. 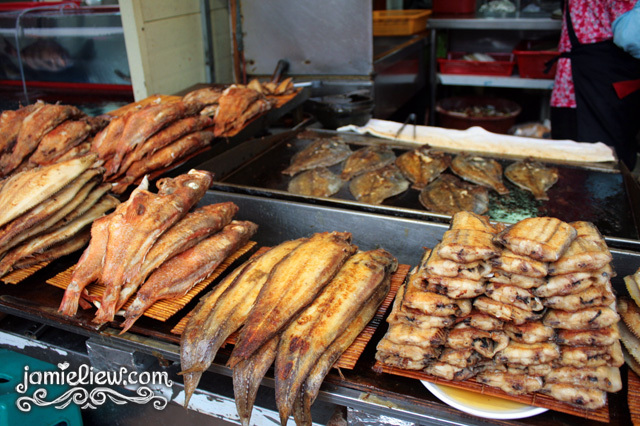 fried fishes. these are absolutely not cheap. 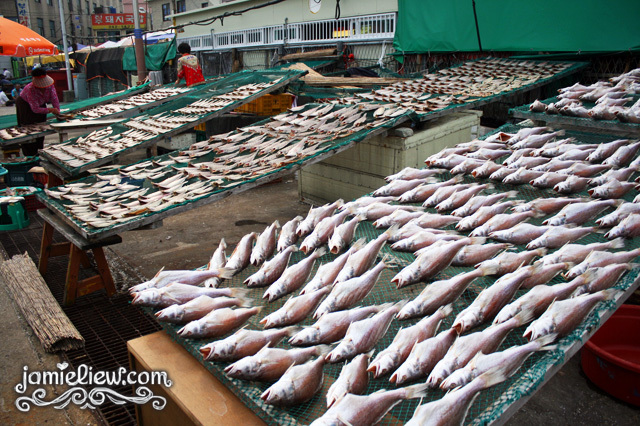 didn’t ask for the price but I went to somewhere else last time are one fish costs 5,000won. 3,000won for a mini sized one. D=. small little “restaurants” behind the stalls. it gave me a feeling that it would cost a bomb so we didn’t try eating here. 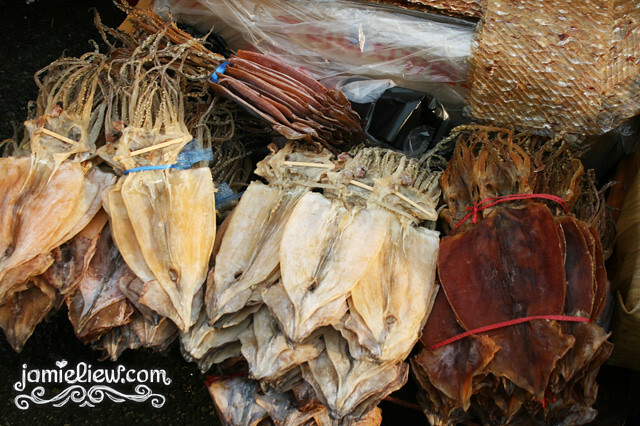 dried seafood! photogenic mussels are photogenic. 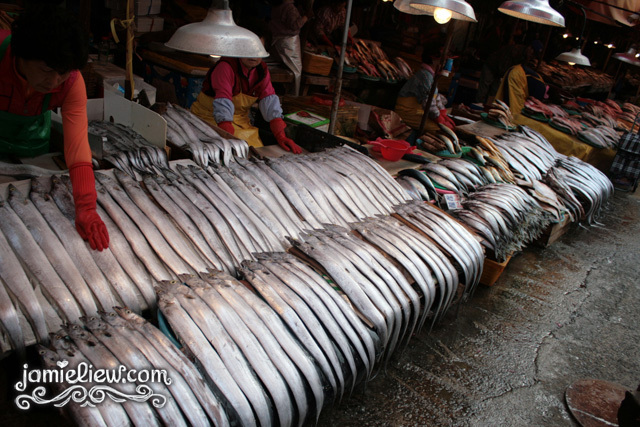 ikan bilis. IN ALL KIND OF SIZES! 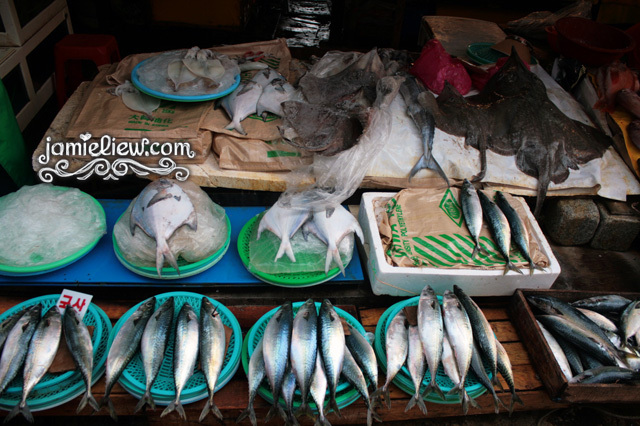 ikan bilis = anchovy. 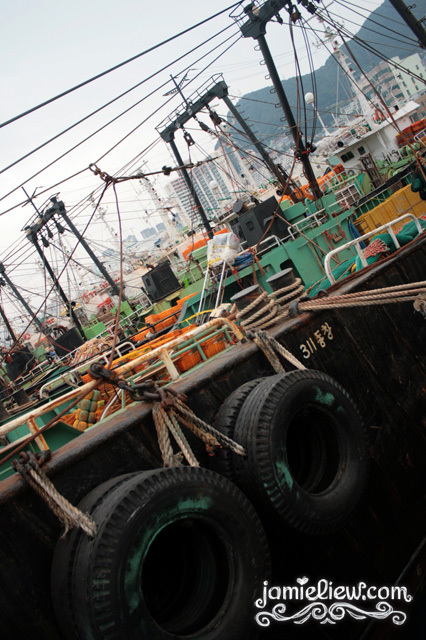 and the fishing boats behind the market parked nicely. I would like to follow them out fishing at least once in my lifetime pfft. can’t pick, so posted both. 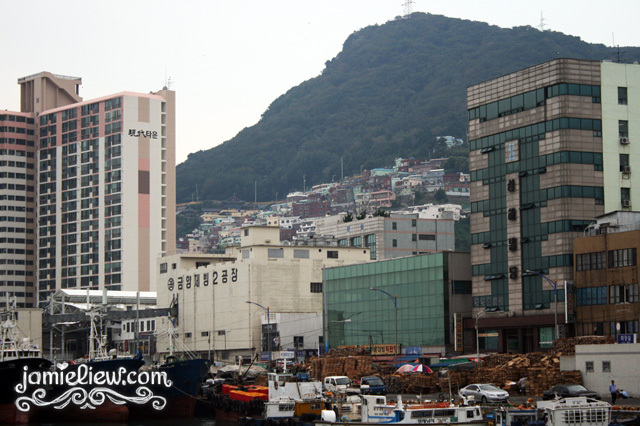 the OTHER side of Busan. houses still very packed. 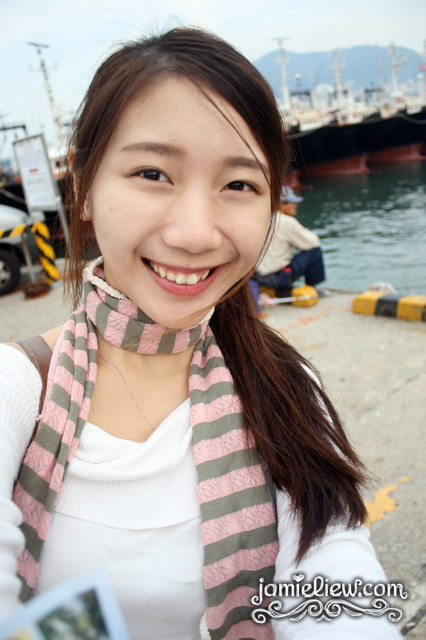 facing the sea! couple t’s are very very IN here. FACT : Korean couples usually have the same pair of shoes. oddest I’ve seen was a guy wearing a girly pair of shoes to match his girlfriend’s. it was.. sandals. but usually sport shoes. then, for those who want to have more things a “pair” would use the same bag, jacket, hat, and nowadays, glasses. I’ve seen this couple who wore the same TOP TO TOE. it was pretty funny because it looked like a uniform like that. TRUTH : I want to do that too. like the same top T_T. or shoes. I find it cute pfft. 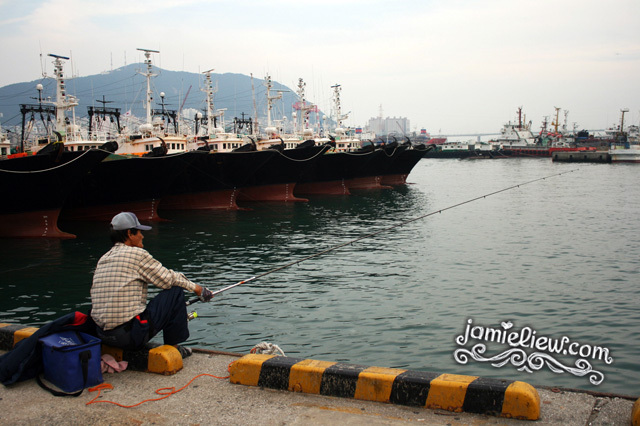 look at that fishing rod. super long. 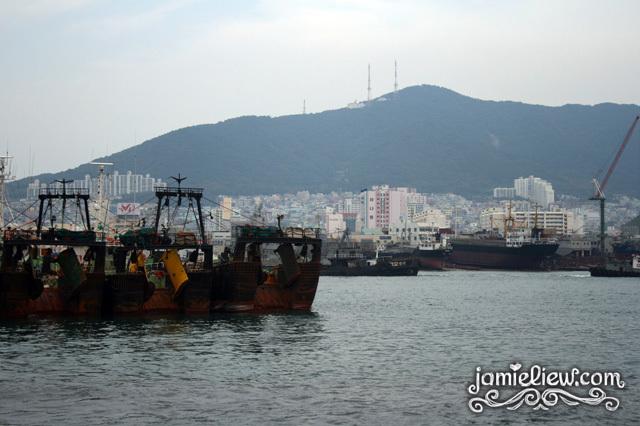 the view that got me in love with Busan. need to be taken from a tall building though. doesn’t look that nice in this picture. oh well I am a lousy photographer =(. these fishes scares the crap outta me close up. 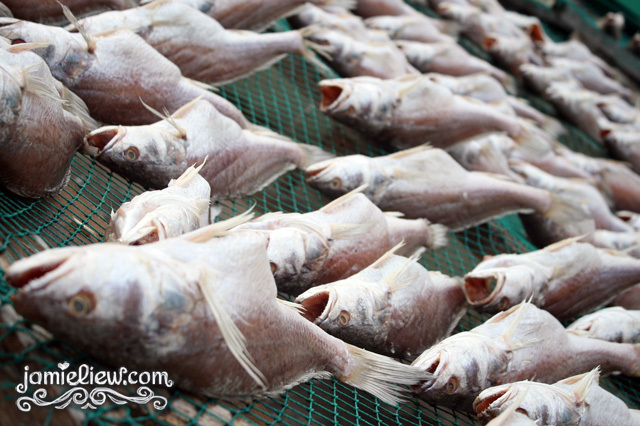 how they dry their fishes. ILLEGAL GAMBLING!! haha not sure if it’s illegal here but they are playing go-stop. but it looked like they were really having fun. 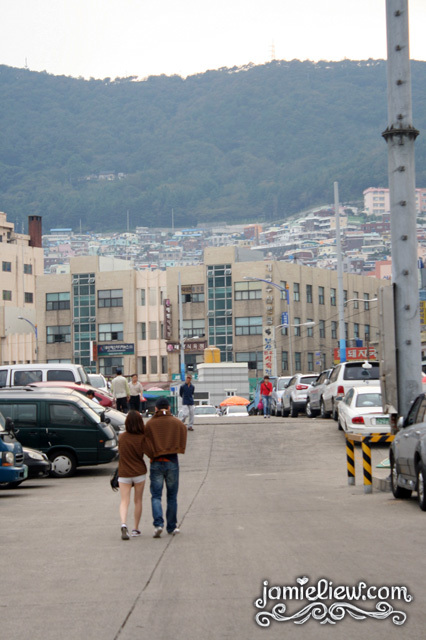 gosh I wanna live in Busan when I grow old and play go-stop with ajosshi’s. =P. another view to die for. minus the vans. 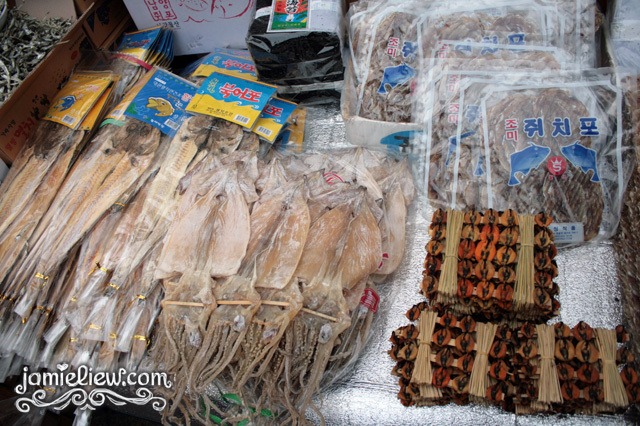 wonder if they are 3 different type’s of squid or just 3 different way of drying it. 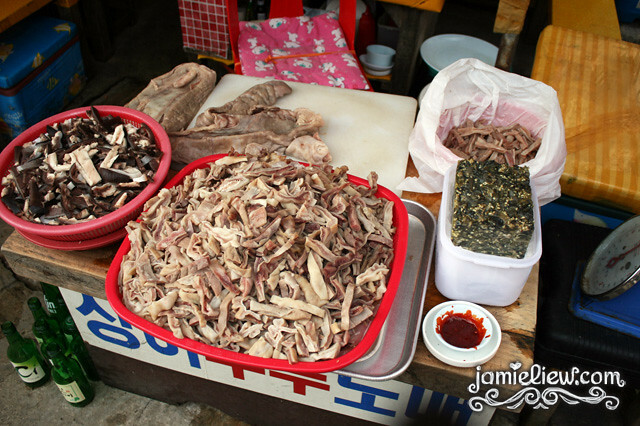 GORAEGOGI 고래고기 means whale meat. *hate. 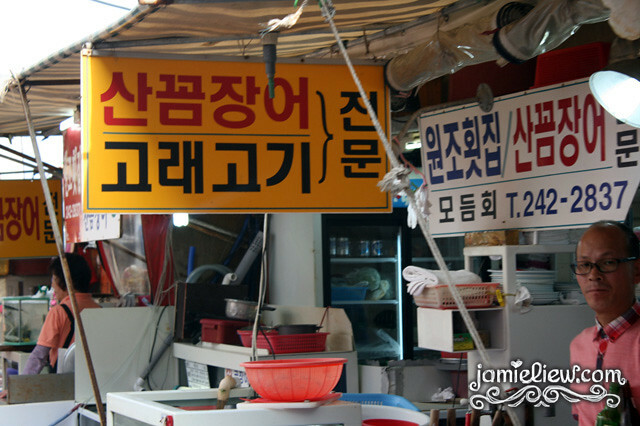 * and SANGGOM JANG-EO 산꼼장어 means live eel. as in you cook it while it’s alive. to show it’s freshness I guess but it looks damn evil eventhough I think the eel is already dead. here’s a very disturbing video of it so watch it on your own risk!!! but this dish is very famous. and that shop above wrote that they are the specialty store for it. and even weirder, we have the Shark intestines. can you imagine how big the shark must’ve been for them to get such a huge piece of intestine? =S. 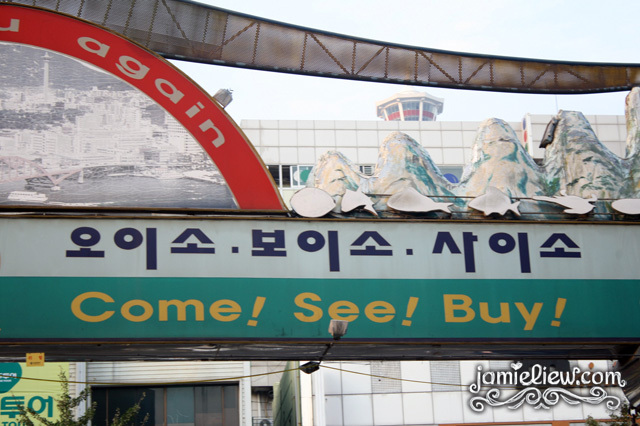 the Busan slang of come, see buy! o-ii-so, bo-ii-so, sa-ii-so! 오이소, 보이소, 사이소! overall, I would still recommend you to come here. because I felt the real Busan here. 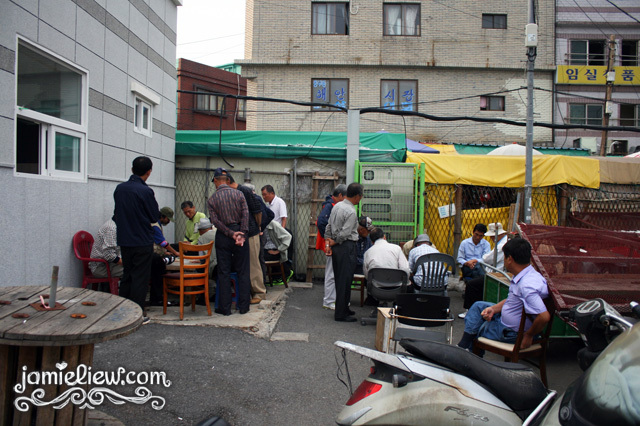 and it is next to Nampo-dong. right opposite. very near to PIFF. just walk over! different. 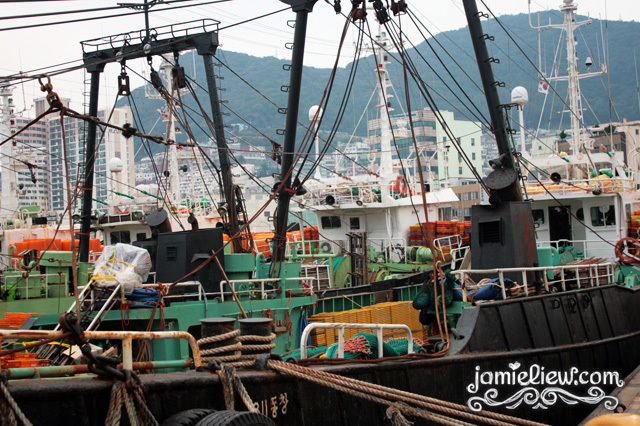 the sashimi’s are in the songdo and gwangalli. they do not sell sashimi here LOL. weird huh. 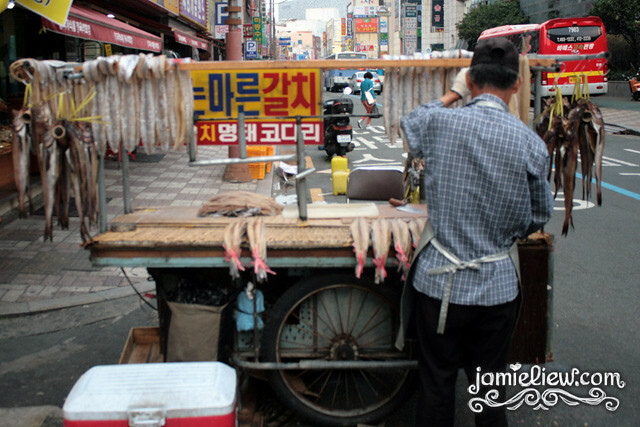 but eels are very famous here lol. so what did u eat there? 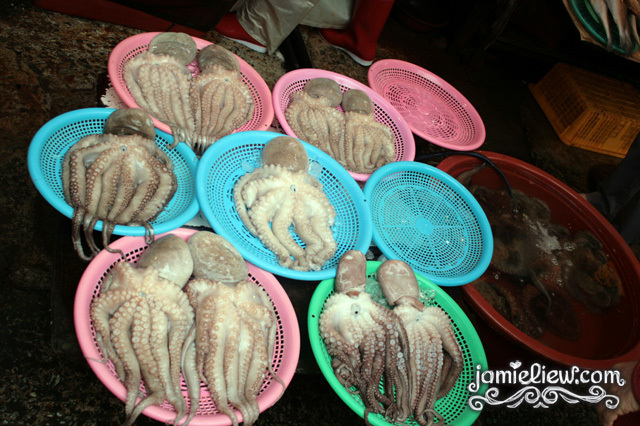 the octopus O.O IS SO FAT! even the rice here is fat wan! birds also! ISN’T IT NICEEE =3. but staying there long term maybe.. not. This post is super drool-worthy. 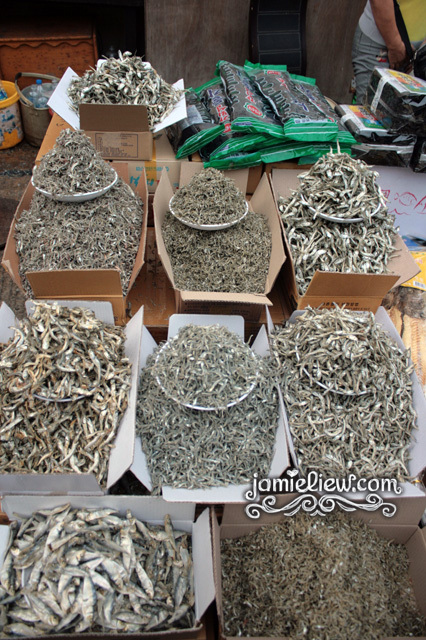 I love visiting markets in different countries. xD visit whenever you have the chance! =3. 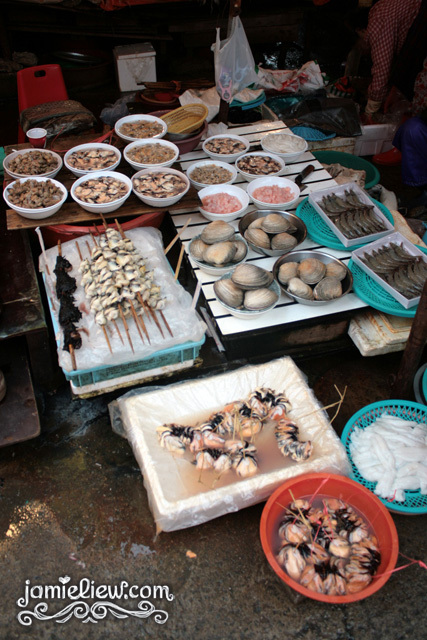 I also love visiting markets in different countries. Really wish to go Korea!!! Looks so beautiful.